To get an accurate and informative understanding of how the District of Columbia is served by park and recreation facilities, it is useful to apply several different tools. No one tool gives a complete picture, but taken together they can provide an accurate accounting of how service is being provided. 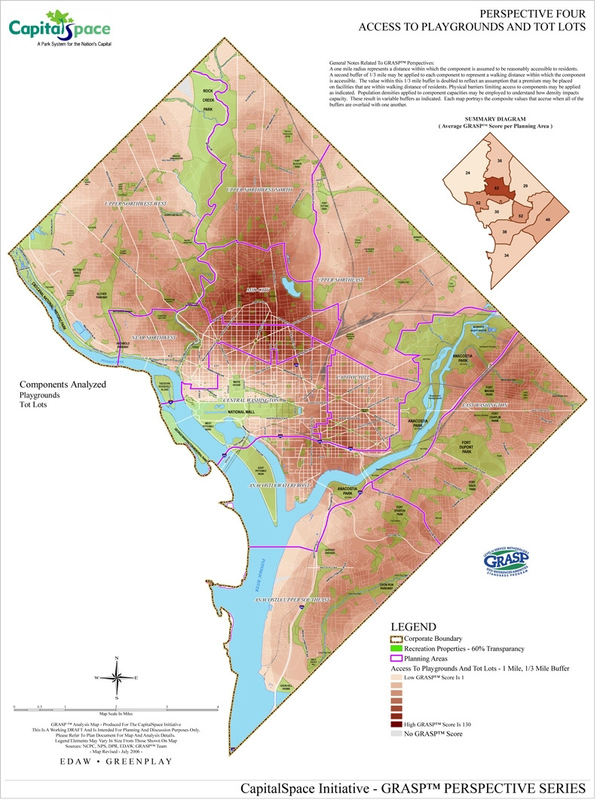 The tools are used to determine the number, capacity and distribution of facilities, and compare these with the needs and expectations of DC residents. One of these tools is the GRASP™ analysis. Another tool is the Capacities Matrix. For the CapitalSpace Initiative, the GRASP™ process provides an analysis of the quantity and distribution of components located upon certain public lands that support the parks and recreation needs of residents. A basic assumption has been made that the availability of components that facilitate various forms of recreational activities and other benefits of parks and recreation constitutes a service to residents of the District, and that this service can be measured and compared from one location to another by examining the availability and access to these components across the geography of the District. To summarize the process, components from the dataset have been used to generate a series of Perspectives Maps. Each Perspective Map was produced by selecting a set of components from the dataset that were determined to play a role in the Level of Service experienced by residents of the District of Columbia for that particular perspective. The components have not been weighted or individually scored, so each component carries an equal weight in the Level of Service (LOS) analysis.